It’s fair to say Danny Clarke hasn’t had the easiest of introductions to life at The Shay. The midfielder’s arrival at Town coincided with the club’s miserable run of nine games without a win, with Clarke not involved in a Halifax victory until he started in the 2-1 win against Chorley nearly two months after he signed. Clarke’s performances have drawn criticism from some Halifax fans for a lack of composure and creativity on the ball, but his displays have improved in his last two outings against Alfreton and Bradford Park Avenue. When asked to sum up the start to his Halifax career, Clarke said; “It’s been tough if I’m being honest. I’ve come into a team which I believe is probably the best group of players I’ve ever played with and I’ve had to adapt to that. I’ve said before that technically I’m not the greatest, but where hard work is involved and we need a big shift, that’s when I come into my own. “There’s a lot more football being played. When I played for Billy previously the teams were always about hard work, pressure, getting the ball forward as early as you can and playing from there. “But here he’s trying to build more from the back and I’ve tried to adapt to that, which I struggled with when I first came here. 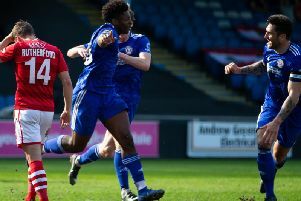 Clarke has been in and out of the side since joining The Shaymen, but says he feels rejuvenated after a spell out of the team. “There was pressure on me to perform when I arrived but I think I needed a break to get training and go back into the position I’m used to,” he said. “I’ve been working really hard away from the club to get myself back to a fitness level I was happy with. I feel like it’s paying off now. “My legs feel fresher. I feel like I’m dominating full-backs physically. I feel more comfortable on the ball and I want to receive the ball to keep attacks going rather than being out of the game. “I didn’t touch the ball for 15 minutes in the second-half at Alfreton until Billy switched me over. I like to constantly be involved. I might not always play perfect passes but I’ll keep going. Clarke was captain of North Ferriby this season and scored 14 goals as they achieved promotion to the Conference National under Heath last term, but he has so far failed to replicate that form and is yet to find the net in 12 appearances for Halifax. On the criticism he has received from some Halifax fans, Clarke said: “I hear things but that’s football. Everyone’s entitled to their opinion. They pay their money to come and they want to see quality players. “There’ll be plenty of players that will be technically better than me but hopefully what I can bring to the team comes through and hopefully that’s appreciated, especially in games like Park Avenue where it’s going to be tough. “I’d like to think the last 10 games is where I’ll come into my own. “The pitches are getting boggy now and there’s some tough games to come so its going to be a battle. you might not see a lot of football but if we can keep getting three points that’s all that matters. “It’s hard when you lose and the fans get frustrated, but there’s no-one more frustrated than us because we know we’re better than that. We know we’re better than the Boston game, we know we’re better than the Alfreton game. “When I first came we were on as great run and then it just went downhill. But we seem to be getting a steady team together now.